This dictionary is a comprehensive reference tool designed to assist everyday people in understanding biblical prophecy. Based on solid scholarship, it contains clear and readable entries on a broad sweep of topics relevant to biblical prophecy, providing insight to complicated subjects in a balanced fashion. This paperback repackaging of the hardcover edition contains the full text of the original. 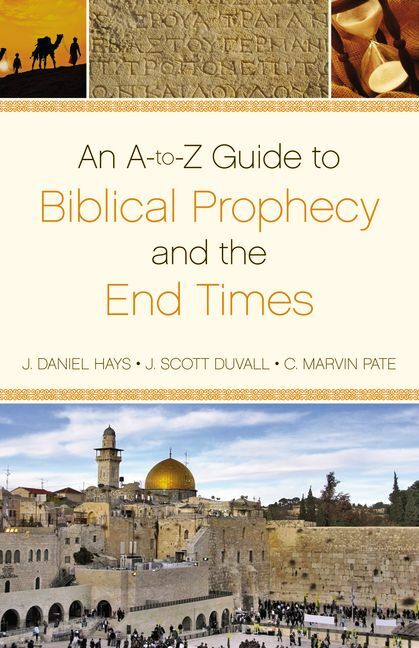 An A-to-Z Guide to Biblical Prophecy and the End Times by C. Marvin Pate; J. Daniel Hays; J. Scott Duvall was published by Zondervan Academic in April 2012 and is our 36870th best seller. The ISBN for An A-to-Z Guide to Biblical Prophecy and the End Times is 9780310496007. Be the first to review An A-to-Z Guide to Biblical Prophecy and the End Times! Got a question? No problem! Just click here to ask us about An A-to-Z Guide to Biblical Prophecy and the End Times.